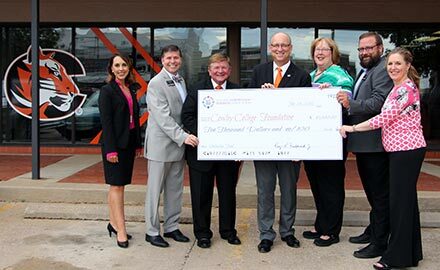 The Wichita Independent Business Association (WIBA) presented the Cowley College Foundation with a check for $10,000 Thursday at the school’s Wichita Downtown Center to establish a Scholarship for future students. The gift will be directed toward students with majors in the BREG Industry Sectors for South Central Kansas (Advanced Manufacturing, Advanced Materials, Aerospace, Agriculture, Data Services and IT, Health care, Oil and Gas, Transportation and Logistics). For this scholarship, WIBA has elected to focus on the Health care sector by providing awards to students in Emergency Medical Services (EMS) or Allied Health Programs. Preference will be given to Sedgwick County residents. Preference will also be given to students entering the Cowley College’s nationally accredited paramedic program, which provides qualified graduates that serve with many Wichita area public safety and healthcare organizations, including Sedgwick County EMS, Wichita and Sedgwick County Fire Departments, and many local hospitals. The majority of graduates from the Cowley paramedic program are Wichita residents that return to serve in the community after completing their education. The paramedic program boasts an 80%+ retention rate, 98%+ certification rate for graduates, and a 100% positive placement rate after graduation. The WIBA scholarship will help alleviate the paramedic hiring shortage that many local EMS services, including Sedgwick County EMS, sometimes face. “Our program trains a lot of students in the Wichita area and this will help kids come to school that might not have been able to,” Cowley College Allied Health Department Chair/Director of EMS Education Chris Cannon said. Along with the check presentation a signing of the Memorandum of Understanding was conducted. Ray Frederick, Jr., WIBA President/Chairman of the Kansas Postsecondary Technical Education Authority, and Wichita Mayor, Jeff Longwell, spoke at the event. Since its founding in 1922, Cowley College has continued to provide a quality, affordable education in south central Kansas. For more than two decades, Cowley has served over 20,000 students in the Wichita Metro, from its early beginnings at the Southside Education Center, through today, with the opening of the Wichita Downtown Center in 2015. Cowley College President Dr. Dennis C. Rittle thanked those in attendance and spoke of how this scholarship will benefit future students of the College. “When a student receives a scholarship they feel somebody now believes in me and are involved in my success and my future,” Dr. Rittle said. Those pictured are, from left, Cowley College interim Vice President of Institutional Advancement/Marketing Director Sarah Bryant, Cowley College President Dr. Dennis C. Rittle, WIBA President/Chairman of the Kansas Postsecondary Technical Education Authority Ray Frederick, Jr., Wichita Mayor Jeff Longwell, WIBA Board Chair and CEO of Goodwill Industries of Kansas, Inc. Emily Compton, Cowley College Allied Health Department Chair/Director of EMS Education Chris Cannon, and Cowley College Foundation Coordinator Elizabeth Thummel.